When the world's most famous living genius says people are too fat, you know it's a problem. Stephen Hawking, the physicist and cosmologist whose literal job it is to study the secrets of the universe, says humanity is slowly destroying itself by eating too much and being deplorably lazy. The man who theorized a revolutionary possible exit from black holes, who has a form of black hole radiation named after him, came to the conclusion that a gluttonous appetite for food and choice to be sedentary has led to an obesity epidemic, which has dire consequences for humanity. Basically, modern humans have turned into black holes themselves, super-massive objects that swallow everything in sight. ZING! The point is that Stephen Hawking knows a lot about black holes. In the end, it's not the aliens or the planet itself (which we're also destroying) that will take out humanity. We're doing a pretty good job of attacking ourselves, thanks to weight-related illness and complications. 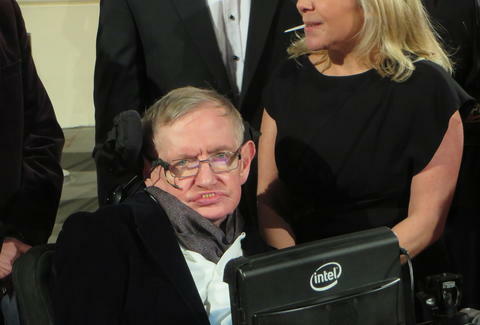 Hawking's message comes in an ad posted by the Swedish health organization GEN-PEP. In it, the legendary scientist warns: "At the moment, humanity faces a major challenge, and millions of lives are in danger. As a cosmologist, I see the world as a whole, and I am here to address one of the most serious public health problems of the 21st century. Today too many people die from complications related to overweight and obesity. We eat too much and move too little." Not only is it a major problem, but it baffles him. "For what it's worth, how being sedentary has become a major health problem is beyond my understanding," he adds. Our laziness and the subsequent self-induced epidemic has even stumped Stephen Hawking, who, again, has forgotten more about the physical structure of the universe than you'll ever know. Unlike exiting a black hole or escaping Earth to colonize on other planets, fixing this obesity problem is relatively simple. Hawking offers some common-sense advice: "More physical activity and change in diet. It's not rocket science." Oh, Stephen Hawking's got jokes, folks! However, there's a counterpoint Hawking should consider: Waking up early to go to the gym and saying no to cheese fries can feel just as hard as solving a quantum physics problem.